My kids and I have developed a bad case of cabin fever. The past few weeks have been snowy and freezing. When we woke up this morning, it was snowing heavily again. With all this snow, no one is going anywhere. Right after breakfast, the kids starting fighting over toys, tv, and games. I needed to take decisive mommy action, before everyone went stir-crazy! I remembered something I saw from Smart School House. 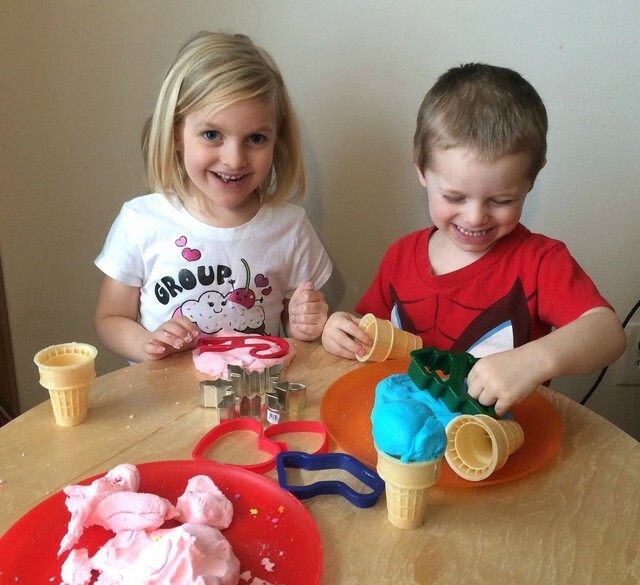 I grabbed a chair for the kids, pulled out my mixer and invited them to help me make Ice Cream Play Dough. 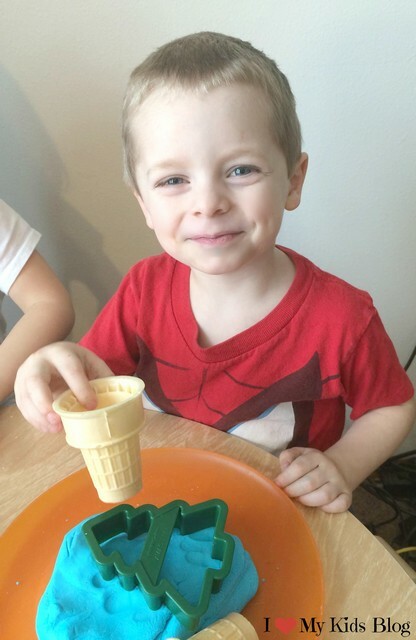 Ice Cream Play Dough is the perfect thing to brighten a blustery day. It smells delicious, is super soft, and is even edible! 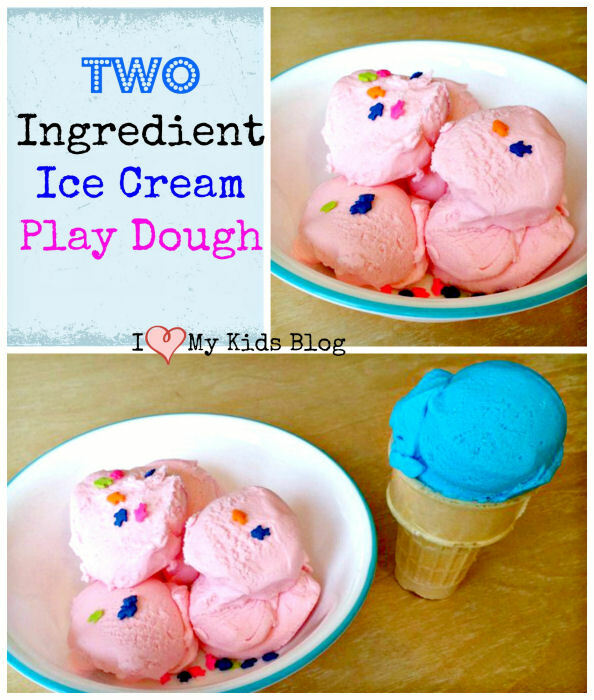 It is the perfect combination of two things every child loves: ice cream & play dough. 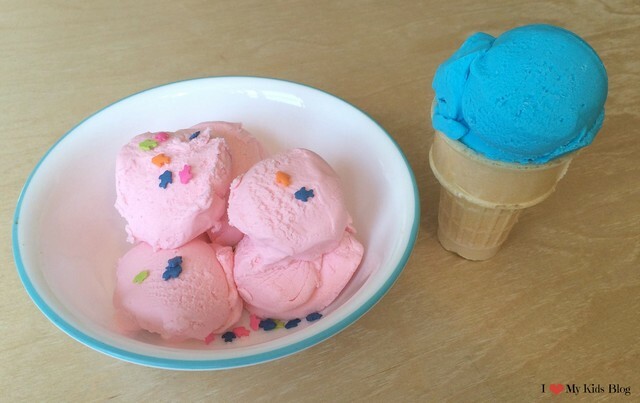 Have you ever noticed how ice cream looks when you scoop it into a bowl or cone? Have you noticed how it rolls into a tantalizing scoop, how it squishes and smushes into ice cream perfection? 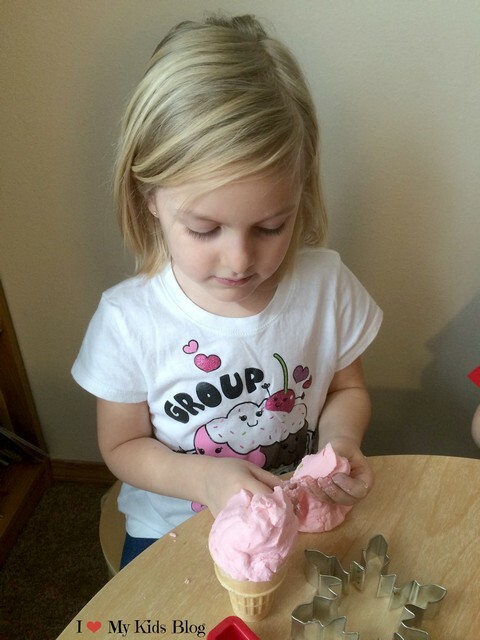 Ice Cream Play Dough perfectly mimics how ice cream looks, moves, and scoops. My kids love to make “food” out of play dough. Ice Cream Play Dough is the best dough for creating huge “sundaes” and gigantic cones. My son was busy building towering ice cream creations, while my daughter was making intricate candies to put on her “sundaes”. 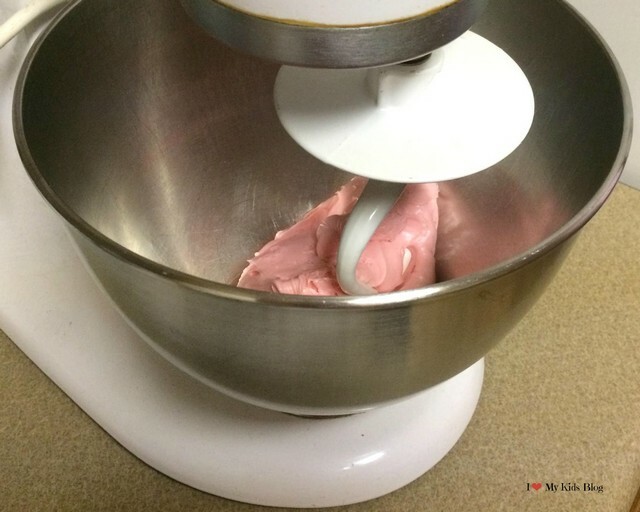 Place the frosting in a mixer with the dough hook attachment. Slowly add the powdered sugar ½ C at a time, scraping the sides often. After you have added ⅔ of the powdered sugar, begin to test the dough for stickiness. 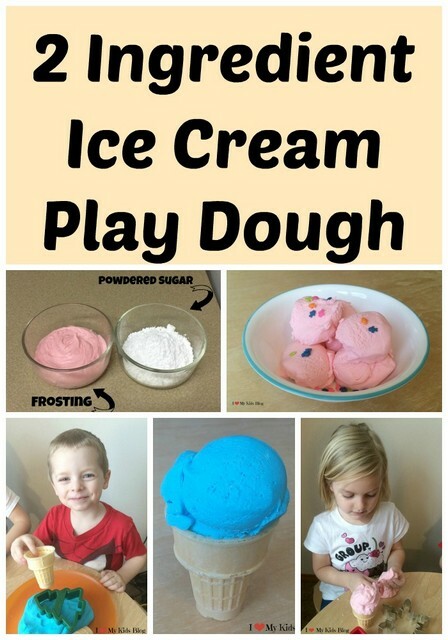 The texture of Ice Cream Play Dough should be very similar to regular play dough. Continue to add powdered sugar, until the dough reaches the correct consistency. 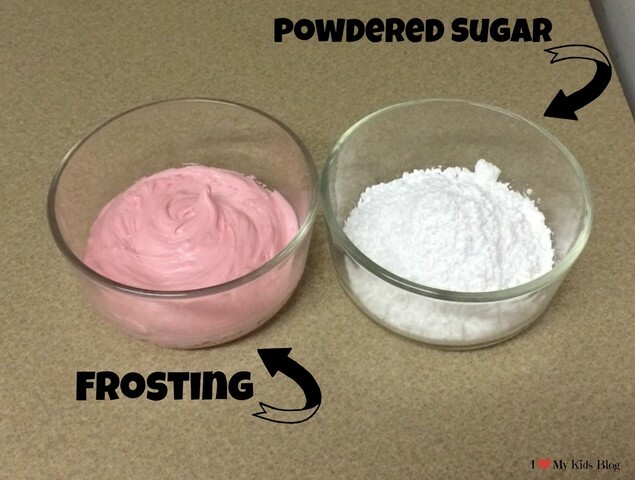 When all the powdered sugar has been incorporated into the frosting, gently knead the play dough. 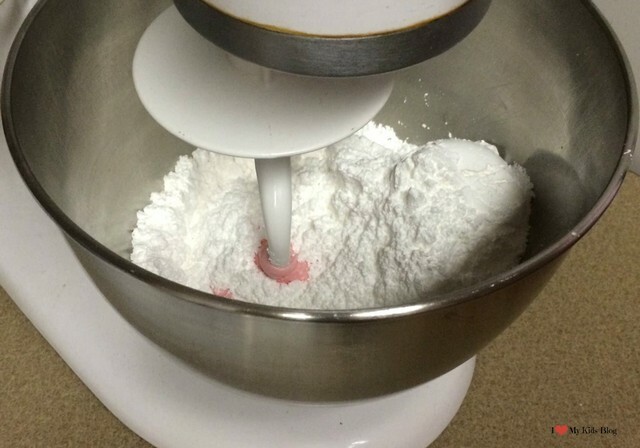 If you add too much powdered sugar, and the dough is crusty, simply sprinkle a little olive oil into the dough. That’s it. It’s really so simple. I gave my children cookies cutters, bowls, and ice cream cones to help them build their delicious creations. After about 45 minutes, the edges of the dough began to get a little crusty. If this happens, simply sprinkle the dough with a little olive oil and knead it in. When my kids were done, I stored the play dough in the refrigerator. It stored well for over a week. With two simple ingredients, you can turn even the most blustery, boring day into a fantastically, fun play day. « How to Make a DIY Indoor Hopscotch Mat in minutes out of a Yoga Mat!